In Psychology, the color blue is meant to be a calming color, and the Sodalite gemstone is meant to bring inner peace with the owner of the stone, one that invokes a sense of serenity and calm – which is what I want the wearer to feel while they’re wearing this piece. I want them to be able to feel at peace and content with the necklace, knowing they look fantastic with this piece of jewelry. 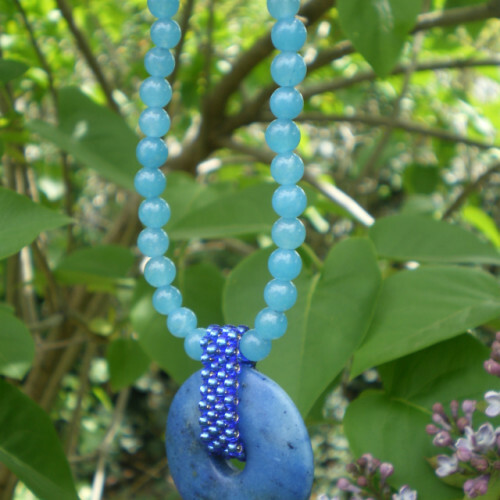 The Chalcedony stones on the string accent the Sodalite center-stone, bringing the whole necklace together in one simple, but beautiful fashionable necklace anyone’ll love.